After taking a year off, the other China Miéville is back. Last year’s Kraken was, whatever its faults, a product of the China Miéville who became one of modern fantasy’s most prominent authors by writing Perdido Street Station and The Scar. Embassytown, Miéville’s latest novel, is much closer to The City & The City than the rest of his work. I suppose for most people this will be great news: The City & The City was rapturously received in most quarters and won more awards than I’m willing to list here, and so far Embassytown seems to be getting fantastic reviews as well. I respected The City & The City but, alas, didn’t actually like it. Embassytown has a better story, but I’m afraid it suffers from some of the same overall problems that The City & The City did. The initial section of the novel relates the backstory of the narrator, Avice Benner Cho, and in the process introduces us to the science fiction landscape Miéville has constructed. On the barely-explored edge of human-controlled space lies the planet of Arieka, inhabited by an intelligent alien species with impressive bioengineering but no space flight. Humans establish a trading outpost there, a small city called Embassytown ruled by Ambassadors who theoretically represent wider human civilization, but who over the years have become a strange sort of aristocracy. Avice is a commoner native of Embassytown who escaped her simple origins to become a spacer and see the world, but she returns after marrying a linguist fascinated by Language, the language spoken by the aliens on Arieka. For most of the story Avice is basically an unemployed dilettante. Unlike her husband, she’s not much interested in Language, but when the interstellar human government tries to change the manner in which Ambassadors are selected, a crisis develops that turns upon the possibilities and limitations of Language. Just as most of The City & The City was devoted to explaining the central concept of unsight at no small cost to its detective story, most of Embassytown is spent examining Language. Embassytown is science fiction, not a detective novel, and that’s a genre more at home with this sort of idea-heavy approach, but still the story ends up being more than a little dull in places. Avice spends almost the entire novel being completely passive, listening to what others tell her about Language, about the Hosts, and about Embassytown’s increasingly shaky government. Miéville seems to have anticipated this criticism, so Avice is proud of the fact she’s a “floaker”, which as far as I can tell is an unnecessary neologism for being passive. It’s true that in the climax, Avice suddenly becomes extremely active, but this seemed completely out of left field given how little she had done up until that point. Perhaps not surprisingly given the narrator is more an observer than an instigator, Avice relates many scenes in what amounts to summary form, and in quickly breezing through such events she frequently amalgamates her feelings and those of other characters into the first person plural. It has often been said, metaphorically, that the cities of Miéville’s fiction are the main characters, but these long stretches of collective narrative actually go some way toward making this literally true of Embassytown the city in Embassytown the novel. This is an unusual approach for a reason: for all the insight it gives us into the crowd psychology that is important in crises, it opens a gulf between the reader and the story’s individual characters. 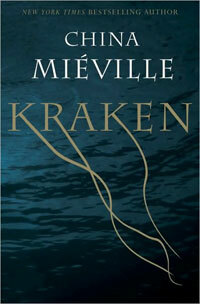 Miéville gets a lot of mileage out of his evocative writing in these segments, but when the focus narrowed for the important, plot-critical scenes after long passages full of linguistic discussion and summary, the characters still felt like cogs of the larger story, robbing these pivotal scenes of some of their power. But if, like The City & The City before it, this is a novel that is focused completely on its ideas, relegating the story and characters to supporting roles, what about those ideas? I wasn’t hugely impressed with the story, but there’s more thought put into Embassytown‘s central ideas than a dozen typical science fiction novels put together. So what’s Miéville up to? There are three ways in which the Ariekei and their Language are unique. The first is that the Ariekei have two mouths and each can make sounds independently. Both “voices” must be used simultaneously in order to speak Language, so right away it’s physically impossible for a single human to speak it correctly. The second is actually not a property of Language itself, but of the Ariekei who speak it: they cannot lie. Lies can be expressed in Language, the Ariekei understand that in theory one could say something untrue, and when humans lie using Language the Ariekei more or less understand it. But something about their minds does not permit them to actually speak something they know is untrue. This means they are incapable not only of lies but also of fiction and even metaphor. They can use similes, but only if the referent is a real thing that exists in the world. At times this leads them to actually change things about the world around them in order to better express their ideas. One of the formative experiences of Avice’s life is when she “enters Language” by being used as the real referent for a simile: “There was a human girl who in pain ate what was given her in an old room built for eating in which eating had not happened for a time”. The third unique element again relates to Ariekei psychology. Not only can Ariekei not understand what the single voice of a human is saying, they don’t recognize it as speech at all, nor do they regard an individual human as an intelligent entity. Further, although human computers can synthesize two-voiced speech perfectly, Ariekei cannot understand that either. The only way to communicate with Ariekei, and in fact the only way to even get to the point where they realize communication is even being attempted, is to have two humans who are almost impossibly similar mentally speak a sentence together, providing the two voices Language requires simultaneously. Now, there’s a lot going on here, more than I can hope to adequately summarize, but I’m afraid that last point strikes me as deeply suspect. Are the Ariekei telepaths? It’s easy to imagine telepathic aliens, but it’s harder to imagine these aliens’ minds would be able to link with ours. The novel doesn’t attempt to explain this. Avice mentions synthesized speech doesn’t work and leaves it at that. I did my best to suspend disbelief, and since proper communication seemed to require extraordinary communion from the two human minds speaking, I figured telepathy was in play somehow. But later on, the fact that Ariekei can understand recordings of paired human speech becomes a very important part of the plot. What could possibly explain their ability to understand recorded but not synthesized speech? The only explanation I can come up with is an unpleasant one: authorial fiat. Although science fiction seems like the natural medium for an investigation of linguistics and thought, I can’t help but think that a fantasy setting would have provided better tools for Miéville to tell this story. In any case, from this foundation, much of the novel is about Ariekei efforts to learn how to lie. I believe it’s implied this has long been an aspiration, but since contact was established with humans and they discovered paired human Language speakers can lie, the Ariekei efforts have grown more intense, to the point of holding festivals where Ariekei linguistic athletes compete to see who can get the closest to speaking a lie. I should mention here that the more I read Embassytown, the more I was interested in what sort of effects not being able to lie would have on their society, but this turns out not to be something Miéville is interested in. Confined to human viewpoints, we never get more than the vaguest possible sense of how Ariekei society is organized or the degree to which their thinking and communication is impaired by their inability to use metaphor or even ungrounded similes. A few characters believe that the Ariekei inability to lie is an indication they are in some sense prelapsarian, and that, for them, learning to lie would represent a calamitous fall from grace. This was another idea I found quite interesting, but again Miéville dismisses it without much elaboration. I suppose we can’t blame an accomplished author of fiction for being unimpressed by such arguments. What Miéville is interested in is contact. The story takes place long after human first contact with the Ariekei, but from a certain point of view, that contact hasn’t truly occurred. Have the two species truly met each other if Ariekei do not realize that individual humans are intelligent, believing them to be unthinking biomachines like those they themselves use? Can the paired human Ambassadors really be speaking the same Language as the Ariekei if they can lie? Are the paired human Ambassadors even human themselves, for that matter, given the elaborate engineering required to make them think sufficiently alike to be able to speak Language and be understood? The novel explores these questions and leans toward a negative answer to most of them. Then, Miéville puts Embassytown under enormous pressure, forcing the characters to try to find some way of making a communications breakthrough. In these circumstances, such a breakthrough isn’t a matter of stringing together the right sounds, but instead one of completely reorienting psychology. Oddly for a book that doesn’t shy away from colonial themes that put the Ariekei in the role of the noble, primitive natives and the humans in the position of outsiders exploiting their access to technology and trade, Embassytown takes it for granted that the psychology that should change is that of the Ariekei. The fact that the native Ariekei mind cannot express something that doesn’t exist, Miéville seems comfortable saying, is a defect that demands a solution. When a “cure” for the alien thinking of the Ariekei is found, the only disappointment is that it cannot be imposed on all Ariekei everywhere, but the narrator rather smugly comforts herself in the knowledge that the trade advantages that accrue to the Ariekei who have adapted to human-style thinking will allow them to out-compete their recidivist cousins. I’m not sure what to make of this aspect of Embassytown. On one hand, it’s refreshing to read a novel where the protagonist triumphs by finding a better way to communicate, not by being especially effective at punching or shooting people. But this business of establishing productive communication between cultures by having one culture obliterate what is unique about the other seems rather, ah, old-fashioned. It’s so counter to modern ideas about multiculturalism that, as I write this, I’m mentally reviewing the story’s ending, looking for clues that the author doesn’t endorse what happens, but I can’t think of any, and Miéville’s past novels have never been so subtle in their politics. It’s been argued elsewhere that Embassytown is best understood through the lens of Hegel’s concept of self-awareness. I’m no expert on Hegel, so I’ll leave that to others, but I will note that if the story is trying to claim the native Ariekei are not self-aware, it doesn’t earn it. In this, Miéville’s purposes work against each other. As befitting a novel of contact, the Ariekei are seen only from the human perspective and are too alien for the reader to truly understand. This makes them that often attempted but rarely achieved science fiction triumph, the convincingly alien species, but unfortunately it also prevents any thorough examination of the affects of Language on those who speak it. Since we are never able to understand how the Ariekei live (indeed, to maximize the effect Miéville doesn’t even properly describe what they look like), we never find out what the implications of Language are. There’s a lot of interesting ideas in Embassytown, but all this leaves me in the familiar position of respecting a Miéville novel more than I like it. How many authors have we seen hit upon a big success and then just try to do the exact same thing for as long as the they can? Miéville could have used the success of his Bas-Lag novels to, well, sell lots more Bas-Lag novels. Instead, he’s branched out in all sorts of different directions. Even though I wish I liked the results so far as much as everyone else seems to, it’s good to see him being rewarded for taking artistic risks. I said it about The City & The City as well as Kraken and I’ll say it again: while this novel didn’t quite click for me, I’ll definitely be back for his next one.